Once again I am in the privileged position as a classical guitar blog writer to receive an advance copy of the latest recording from one of the planet’s finest guitarist. 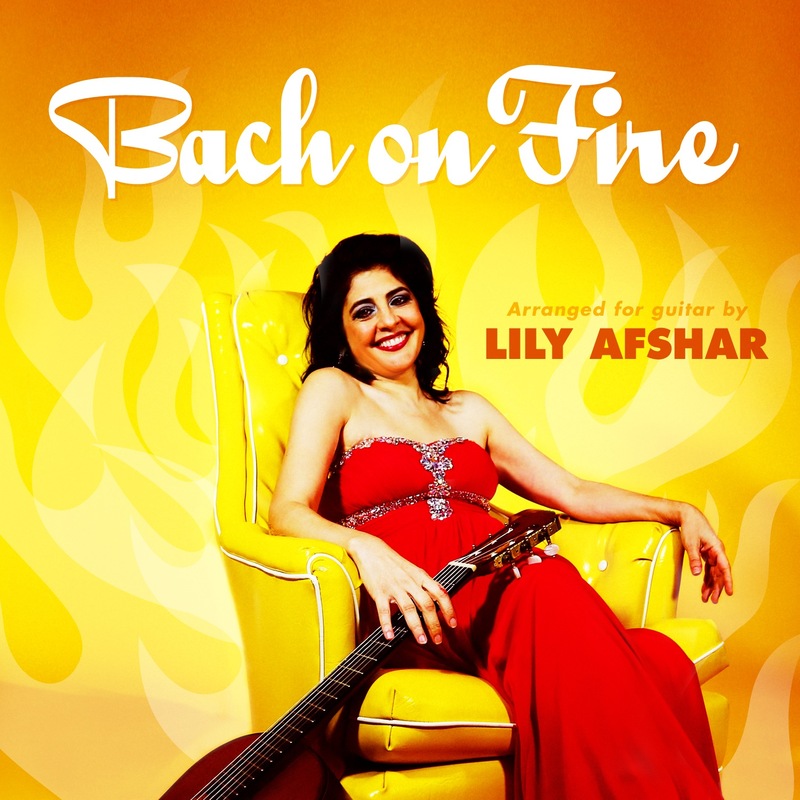 This month it is the latest recording from the wonderful Lily Afshar. Bach On Fire (Archer Recordings) is Afshar’s seventh offering and, as the name suggests, takes us through some of J.S. Bach’s most cracking works including Cello Suites, Prelude, Fugue & Allegro, Lute Suites and Ave Maria. As Lily so clearly demonstrates through her own personal transcriptions of lute and cello works, Bach certainly indeed was on fire. As is Afshar herself at the moment. Not only is this recording following on only six months (or thereabouts from the previous recording), but all the transcriptions on the album are transcriptions that Lily has made herself – this record should be called Lily on Fire! Bach on Fire draws its title from these innovative arrangements of Afshar’s. These, according to the woman herself, allow for more interpretive phrasing and dynamic nuance and, ultimately, a more exciting performance. And to be honest this really does come through in the recording. The music, which is music we’re all very familiar with, has a fantastically fresh and vibrant quality to it. That’s no mean feat I can tell you. Kudos to Afshar. My particular favourite on the album is the arrangement of Cello Suite No. 1 (BWV 1007) – the Courante has that sprightly, “running” quality that a courante should have. Lily also manages to really capture the warmth and depth of the cello, with very clear lines (so important in Bach), and making the music sound as if the guitar is its natural home. I must get my hands on a copy of this score. I must also make mention of Ave Maria too which, for me, is one of those tunes that usually makes me go “ohhh, not again….“. In this instance though, Lily manages to capture and communicate the simple beauty inherent in the music. A simple, unfussy, clear arrangement that, again, sits so very well on the instrument. Listening to this recording makes me feel rather excited and want to play it all for myself! On fire indeed! Afshar’s new arrangements are the result of many years of experimentation and watching students struggle to play Bach. Knowing that the amount of bass notes and poor fingerings posed a technical challenge for most players, Afshar employed techniques like cross-string fingerings to make the music sound as if it were written for the guitar. “After years of using whiteout, pencil and eraser to adapt other Bach guitar arrangements, I decided to make my own editions from scratch,” she says. Afshar arranged 42 Bach movements which were published by Mel Bay in 2013 as Essential Bach: Arranged for the guitar by Lily Afshar. (Note to self: I must check this out!). Whether you’re a lover of classical guitar, Bach, or want to hear what some absolutely top-notch arrangements of some of Bach’s seminal works played by a top-notch guitarist you definitely need to check out Bach on Fire.